Yes it's world card making day this Saturday, 3rd October. Card making apparently goes back to ancient Chinese times ... and today there at least 1 in 6 American households that participate in card making and over 80% of scrapbookers are also card makers. So join the SCRAPBOOK DIVAS girls this w/end for some quick and easy card making challenges ... and there are RAK's up for grabs. Check out the forum here for all the information. 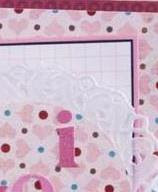 Diva Rach has already whipped up a sample for us ... here's a sneek to whet your appetite.